Olivier Cousin Needs Your Help! Most winemakers don’t treat their vineyard like a treasured hand-tilled garden, or choose to work their land with horses. Olivier Cousin does choose these ways, and for those reasons he doesn’t fit into the established order of French Winemaking. 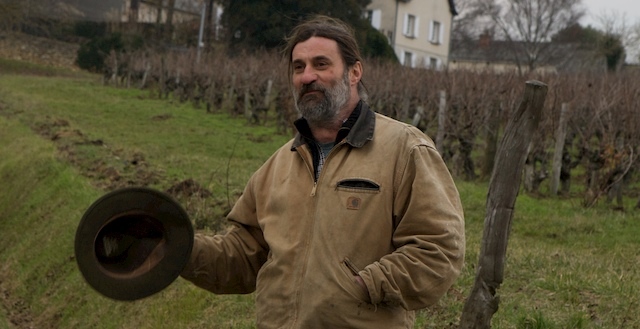 He, like many other natural winemakers, has decided not to work within the Appellation Origine Controlée system anymore – a system that has been broken for quite some time. They instead choose the Vin de Table (Table Wine) classification. Inter Loire, the French government authority that oversees the appellation system, sees some of his labeling practices as a challenge to their authority. A distributor of Olivier’s in Europe, in attempt to have a little fun, adorned some of his cases with “Appellation Olivier Cousin.” They were poking fun at the system, and at the same time making a statement that Olivier’s wines are entirely unique, and also more representative of the AOC Anjou than most AOC Anjou wines, since his wines are the expression of this unique place and terroir. Inter Loire has responded to this joke with very a very serious reprimand. They have locked Olivier’s bank account, and are threatening him with jail time, for this heinous offense, and for using the words “Anjou pur Breton” on his label. For more details on the case, check out this decanter article. Please show your support for Olivier and sign the petition below, and it will be forwarded to the appropriate authorities in France. The box has been filled in with the French and English versions of a letter that is being passed along, but feel free to add your own thoughts about Olivier’s wines and his importance in the US marketplace. Your comments on the petition and email address is kept confidential, however if you’d like them to be public, please leave them in the comments below! Update: You can also help Olivier by buying a tee-shirt here. PLEASE NOTE: If you have already signed another petition, do not sign again here. l’identité angevine dans le monde entier. : il soutien activement et physiquement les jeunes installations. We are indignant that he is being accused of harming the name of his Appellation. Loire Valley, and particularly the little-know Anjou AOC throughout the world. appellation: he actively supports and gives his physical energy to helping young winemakers starting new vineyards in Anjou. vines throughout the Loire Valley. Jennifer Groves Concerned consumer, United Kingdom. Lawrence London Descended from French Huguenots, natural market farmer, permaculturist and 100% supporter of Oliver and all other small farmers and gardeners who are conscientious about their craft. Anton Stepashchenko oenology specialist,Unicork-M Ltd.
Edward Morrissette I am a wine consumer living in the US, and it is reprehensible for the AOC to act like this. M J Washington, DC U.S.A.
new york / los angeles, usa. Lew Haugh Give &#039;em hell, Olivier. Juan Alberto DNI:53131911W Narbona Rodriguez Single, Vigneron, Madrid, EspaÃ±a. luke spindler Landscaper/ tree service care taker, Peconic River Herb Farm, Calverton NY. dr wayne garland Master Formulas, Inc.
Efrain Madrigal Sales, Eno A Manao, Chicago, IL, U.S.A.
Peter Joseph President, PMJ Capital Corp.
Kazuhiro Nishioka Sizuoka Pref., Japan. Kevin Gilmore Wine Buyer, Wakefield Liquors, Wakefield, Rhode Island. Neil Rosen sales rep…Rosenthal Wine Merchant, New York, USA! Anna Aldridge Wine Marketing Consultant, Melbourne Australia. Jonathan Kemp Wine director and buyer at Bottle Market, Upper East Side Manhattan. Bender B. Rodriguez (C&#039;est des) conneries! Matthew Cohen co-CEO software company. Benlly Polanco Enterprenuer Wine &amp; Food industry. Joshua Perry Accounts Manager, Communal Brands. Joe Salamone Wine Buyer-Crush Wine and Spirits. New York, NY. Oscar Hernandez Olmstead Wine Co.
Catherine Saillard Owner of Restaurant iCi in Brooklyn, New York. Nicole DeCicco wholesale distributor Upstate Wine Co.